The Wren’s Nest turned out to be the perfect rustic venue for Laura and Mark’s dream wedding. Modern Vintage Events helped them plan the elegantly chic and simple celebration, and the result was the homey, relaxed day that they always wanted. They incorporated some DIY when possible, including a guest-requested playlist, handcrafted card stock wedding programs, and two little wooden “love birds” topping the cake! The details fell together perfectly, and Laura and Mark with their family and friends danced the night away under a sky full of Tennessee stars. Hire wedding planners! The good ones keep you on track with planning, scheduling, and organizing the months leading up to the big day so that the process is much more stress free and enjoyable. Also, some of the best advice I received before starting to plan my wedding is that everything is negotiable! 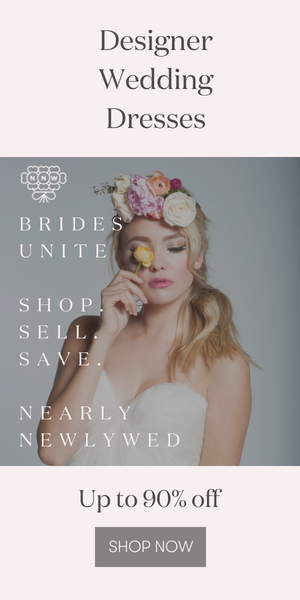 Don’t be afraid to ask the vendor what their best price is: from food cost, to cake options, to light rentals, and the dress. First and foremost, we wanted out wedding guests to feel like they were at a big celebration in our living room. We wanted them to feel relaxed, and at home under the Tennessee summer night sky; like a big family. The most memorable part of the day was during the ceremony, under a canopy of trees and twinkle lights, the rain clouds parted during our vows and the sun beamed just on our faces. It was a moment we will never forget, because it solidified eternity. We created “cootie catchers” (remember those from 3rd grade? ), and had fun facts about the Newlyweds printed on the inside for conversation starters at dinner. On the outside we printed the guests’ names and placed them at their assigned table. My Maid of Honor is extremely talented, so I utilized her talents to DIY our wedding cake toppers – two paper cut outs of birds that said “Love Birds.” I also had her design the wedding programs that we printed on card stock and attached to crafting sticks so the guests could use them as fans since the ceremony was outside in humid June! We wanted to give back to charities that are meaningful to us as a couple in lieu of wedding favors. We had two charity options for guests to drop tickets into jars for their preference for a donation to be made in their honor. Congratulations to Laura and Mark on their gorgeous summer wedding at The Wren’s Nest! Love their rustic wedding? Check out this southern chic Nashville wedding at Historic Cedarwood. I really am a fan of rustic weddings as they emulate warmth, tenderness, love and joy. Very lovely selection of flowers for the bouquets and table centerpieces! This wedding looked truly magical. Thank you so much for sharing this wedding! It was such a wonderful day and such a great experience to get to know Laura and Mark!